It was about ten minutes past seven on a Tuesday morning as I arrived in my office. We just live next door about fifteen steps across the parking lot from the main house. Almost each morning I am at my desk before seven thirty attending to my morning tasks. I turn on my computer and go on line to check the overnight activity, new reservations, credit card deposits today’s arrivals, how many checkouts, and I glance at the schedule to see who is coming in to clean rooms. I can hear the kitchen staff talking as they go about frying bacon and putting home fries on the griddle in preparation for the morning breakfast regulars. I can hear Karen as she chops corned beef that was cooked slowly overnight preparing our corned beef hash. I can smell the coffee. Two young women walk past me and stop and ask me where the dining room is. As I get up from my chair and direct them to the dining room something goes off in my mind and I wonder where did they come from? Nevertheless, I tell them the waitress hasn’t arrived yet but help themselves to coffee and Marsha will be along shortly. As I start back to my office, I realize that neither woman was an overnight guest and I know they did not come in the front door and if they came in the back o I would have seen or heard them. I retraced my steps to the dining room finding them just starting to sit and asked what door did you come in? One said we came in late last night and no one was here so we just went upstairs and found a room and went to bed. I instantly knew they were in the wrong bed & breakfast. This happens once or twice each year, and we just accept it. I asked what time they came in and asked them their names knowing that I did not expect two women in last night, but I wanted to be sure. I said what bed & breakfast were you supposed to stay in last night? One answered why are you asking? I explained that I didn’t have them as registered guests and was wondering if I had made a mistake. As our conversation continued it became clear they were in the wrong B&B. They were supposed to stay in another bed and breakfast but missed the turn or got confused and just assumed we were the one. Of course, I made them feel at home and told them to have a nice breakfast and not to be concerned that I would make it right. I called the B&B they were supposed to be in, and the other innkeeper and I do what many innkeepers do we split the difference. The guests had made a reservation for two nights. I explained what happened and what I had done to make the situation simple. They stayed with us one night and tonight they will go to the other bed & breakfast each innkeeper gets to charge for one night and all are happy. If you are thinking of becoming an innkeeper with a bed and breakfast home, a bed and breakfast establishment or an inn. You need to like people have patience, prepare for the unexpected and expect the unexpected will happen even if you are not expecting it. 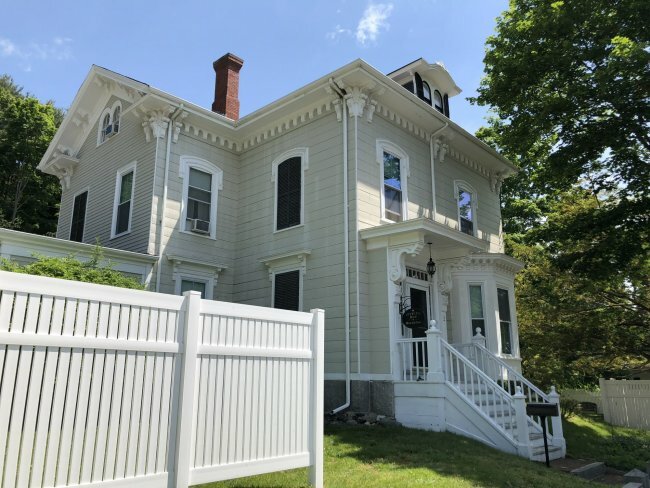 My wife and I never intended to start a bed and breakfast and here we are seventeen years later with eight-room inn four apartments and a dining room that will seat thirty-eight to forty people. Our submersion into this business was natural! It has been almost like buying a boat you start small always wanting something bigger. Our journey has been a good trip constantly meeting new people, as we become a part of the lives of strangers. Some guests are so laid back and gentle that you instantly become friends. Others usually take some time, but with a welcoming word, sometimes a glass of wine or just asking how their day has been will break down any barriers or fences that have been erected to keep out the dust of life. We have many memories, of joy sadness, excitement, grief, uncontrollable laughs shared with all of our guests each contributing to our cup of happiness as it overflows with gladness. Some of our guests come and go with few words but each has left a footprint in the sands of our lives. Every guest leaves a memory of their stay somewhere even if it is a short goodbye, a comment about breakfast, or the comfort of the bed. Something said or done is filed away somewhere in our vast collection of memories to be recalled in quieter times. Many of the experiences we enjoyed over a period of seventeen years will take a lifetime for others. We go to work each and every day with a smile knowing that we are about to experience something new and exciting. Experiencing joy, love, sadness, grief, all of those things that make up who we are have become good teachers to us. As we accommodate and provide a good experience for our guests, we find in turn our guests also open themselves as we talk, learn and share their lives. These are the unspoken things that bring richness and fulfillment to a life well lived. This is what makes a good welcoming inn and good innkeeper.